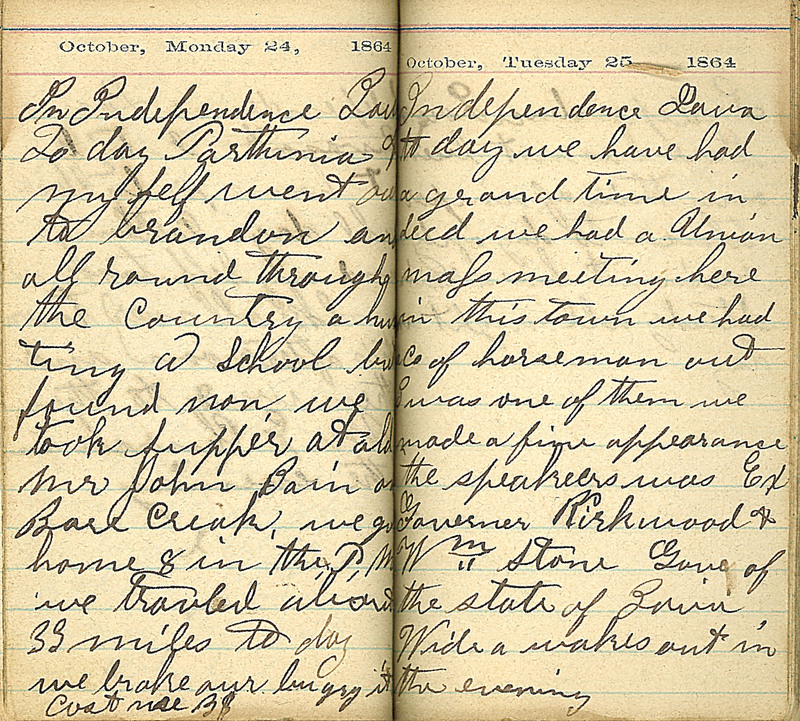 October, Monday 24, 1864 In Independence Iowa To day Parthenia & myself went out to brandon and all round through the country a hunting a school but found non, we took supper at old Mr John Bain at Bare Creak, we got home 8 in the PM we travled about 33 miles to day we broke our buggy it cost us 3$. October, Tuesday 25, 1864 Independence Iowa to day we have had a grand time indeed we had a Union mass meeting here in this town we had a Co of horsemen out I was one of them we made a find appearance the speakers was Ex Governer Kirkwood and Wm. Stone Govr of the state of Iowa. Wide Awakes out in the evening.